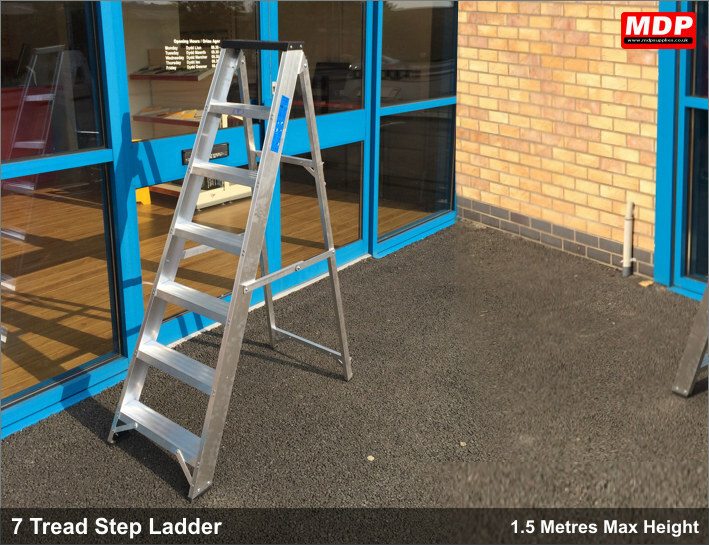 A range of aluminium step ladders and combination ladders for sign makers. All are made in the UK, meet all BS standards and are kept in stock for next day delivery or in-store collection. Please note only available on UK mainland due to courier size restrictions. 7 tread step ladder. Weighing just over 5kg this industrial step ladder is easy to carry. It features non slip treads and rubber feet. Opens up to 1.5 metres high. Closed length 1.65m. Price for 1+ £62.95 ea. 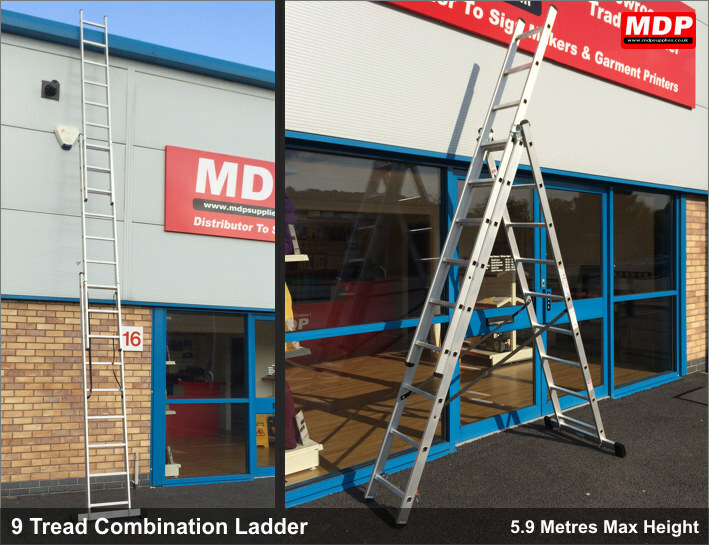 6 tread combination ladder that can extend to 3.4 metres. This multi purpose ladder can be used as a standard 3 section extension ladder or a double sided step ladder. With a large stabiliser bar for stability and D shaped rungs for comfort this ladder has a closed length of 1.7m. Price for 1+ £82.95 ea. 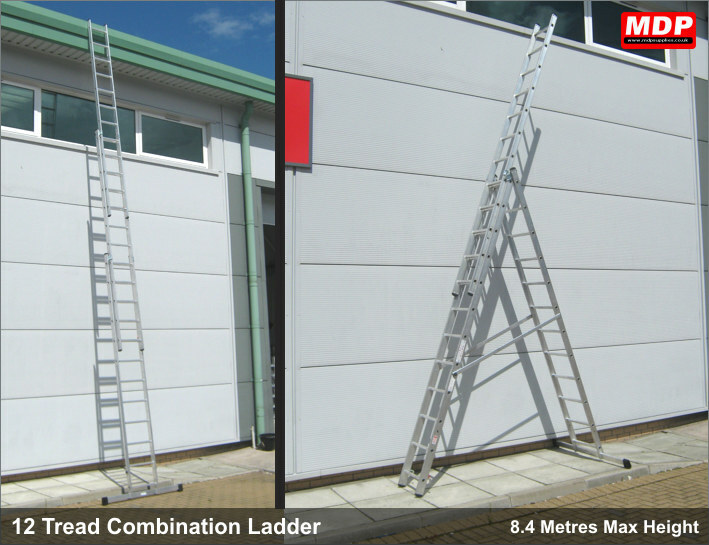 9 tread combination ladder that can extend to 5.9 metres. This multi purpose ladder can be used as a standard 3 section extension ladder or a double sided step ladder. 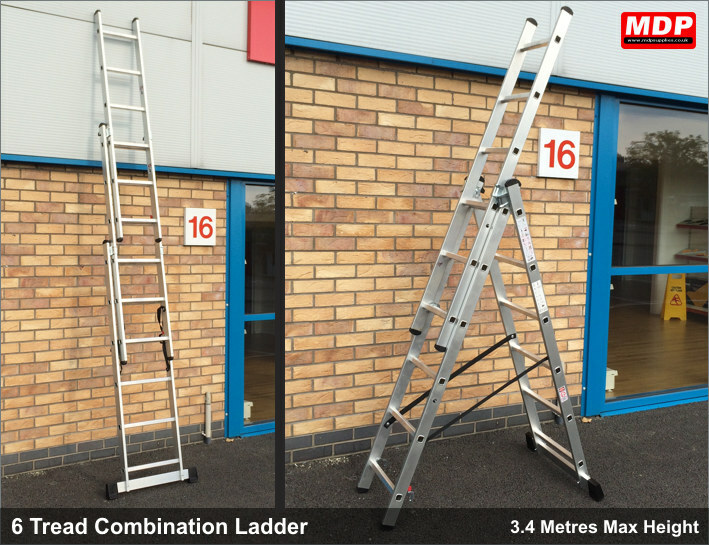 With a large stabiliser bar for stability and D shaped rungs for comfort this ladder has a closed length of 2.6m. Price for 1+ £124.95 ea. 12 tread combination ladder that can extend to 8.4 metres. This multi purpose ladder can be used as a standard 3 section extension ladder or a double sided step ladder. With a large stabiliser bar for stability and D shaped rungs for comfort this ladder has a closed length of 3.4m. Price for 1+ £187.95 ea.